A little while back, my friend Deborah asked me if I would be interested in learning how tofu was made. I couldn’t think of any good reason not to be interested, so I said, “Yes,” and met up with her and a few other nice people at the Hodo Soy Beanery in Oakland. I enjoyed the tour, alright. In fact, it got me thinking, for once, about soy. 1. Soy milk is a a godsend to the multitudes of breakfast cereal-loving, lactose-intolerant people in the world. 2. Tofu is a much relied upon meat substitute for vegetarians and the poor of Eastern Asia. 3. Thanks to plant estrogens (phytoestrogens) found naturally in soy beans, if I suddenly took to eating nothing but soy products, I might grow female breasts. Number three, by the way, is totally false, so far as I can tell. Consumption of plant estrogens have no effect upon testosterone levels in males, which makes me wonder if a high intake of fenugreek (which contains phytotestosterone) would actually make me bigger, hairier, and stronger. And, though numbers one and two are essentially correct, I found that my opinions of soy were based solely upon the notion that it merely existed as a substitute for other things– things that other people might neither be able to digest nor afford. I had never considered soy products like tofu as foods that deserved to stand on their own merits. That is, until I met Yuba. 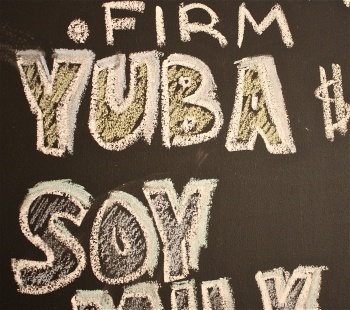 For those of you unfamiliar with the stuff, yuba is the Japanese word for “skin”, which is precisely what it is– the skin that forms atop heated soy milk, much the way a skin forms atop heated cow’s milk or even chocolate pudding (which is giving me ideas). Yuba-making is one of those (blessedly) rare food stuffs that cannot be produced by machine without sacrificing the texture and quality that makes it attractive in the first place. It must be plucked by hand from a heated basin of soy milk, folded, left to hang and drip dry, and then folded again. The result is silky and a little creamy, with the texture of that thin layer of scrambled egg that might coat the bottom of a non-stick pan. It is my new food crush. 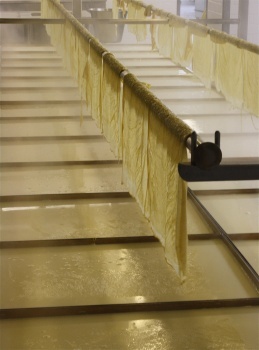 Yuba can be pressed into blocks, cut into noodles, fried, eaten like sashimi, and God knows what else. Loving the texture as much as I do, I was even tempted to paper my kitchen walls with it, which would have been lovely for about a day, until it started to decompose. I look forward to playing with it some more, perhaps even making my own. And, of course, now I’m wondering if a chocolate pudding yuba would actually work. Does the Yuba City Chamber of Commerce know about this stuff? I think they might be missing a wonderful marketing opportunity. In the mean time, I’ll just let the yuba tell me what it needs. Today, it told me it felt like being a salad, so I just cut it into noodle-like strips, threw in a couple of playmates, and tossed them all in a simple dressing. And it’s really, really good, too. 1. In a small bowl, combine sesame oil, fish sauce, rice wine vinegar, and tamari. Set aside. 2. 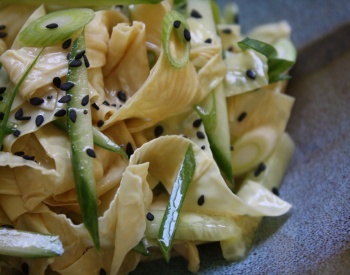 Unfold your sheets of yuba and slice into noodles– the wideness of which is entirely up to you. In Italian-speak, mine are slightly wider than tagliatelle. Add julienned cucumbers and sliced scallion. 3. Whisk dressing and drizzle over yuba. Toss with hands (clean, please) and taste. Adjust seasonings, if desired. Transfer into serving dish, garnish with black sesame seeds, and consume– fresh. 4. Repeat as often as necessary until you get over your newly-found yuba fetish. This entry was posted in Uncategorized and tagged estrogen, recipe, soy, tofu, yuba, yuba salad. Bookmark the permalink. 4 Responses to Yuba City. Ooh, this looks delightful! I’ve never looked for yuba before… is it easy to find? You are such a good writer that I feel that I need to sound intelligent. I hope that you continue to write and never lose your curiosity of new things. Susan– I hope to g-d I never lose it either. And thank you, thank you very much. It’s comments like yours that keep me going, you know. In My Own Little Corner.